My mom and dad headed up to my sisters for the Thanksgiving holiday earlier than I did. Just before she left my mom found an adorable blog post explaining how to make Christmas Treat Place Cards. 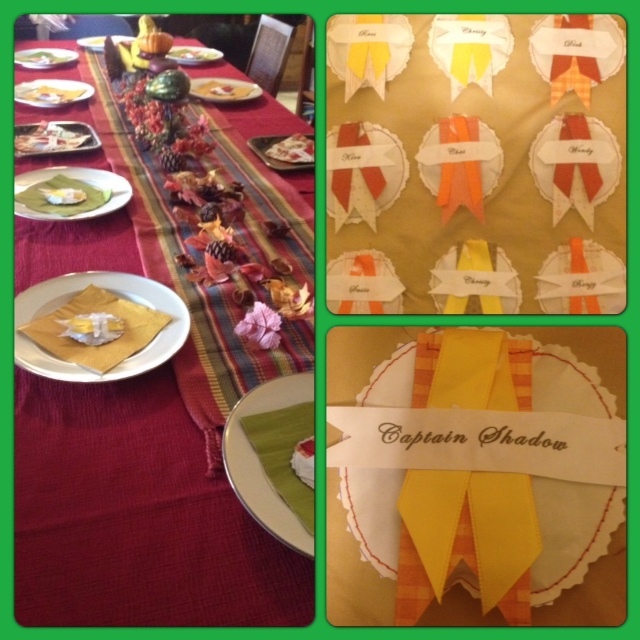 She mentioned she had wished she had seen the post earlier since it would make a fantastic addition to our Thanksgiving table. They looked like fun so I volunteered to make them. As usual, I glanced over the original how-to before going out on my own. The original are pretty fantastic so if you want to make this “right” head on over to A Spoonful of Sugar and check out her blog. If you prefer to take the road less traveled and want to follow me … read on! * Grab your freezer paper (I used freezer paper instead of baking paper because that is what my mom had on hand when she brought me the supplies for this craft. The freezer paper is nice because it’s a little heftier although I like that you can see the treats through the thin baking paper. Pick your poison. Both seem to work.) and tear/cut out rectangles big enough to fit two of your chosen circle size on. * Fold each paper rectangle in 1/2 and grab your circle pattern (I used an empty ribbon spool because it was sitting there staring at me. You can use a wine glass, wine bottle, coaster, really anything round that you have on hand. This is just a list of the things I happen to have close to me at all times). Draw a circle on each folded paper. I used a pen. Don’t do that. Use a pencil. The pen was annoying since it was impossible to make the writing disappear. The lighter the circle you make the better off you are. Logically I knew this before I started tracing around my ribbon spool but I couldn’t find a pencil. Do as I say not as I do. * Grab some thread and get your sewing machine ready. To be fancy I used brown thread on the bobbin and red thread on the top. Okay. I admit it. I wasn’t being fancy just lazy. I already had a full bobbin full of brown thread and it was just easier to do that. * Carefully sew around each circle you traced leaving a small gap at the top. Sewing a small circle really isn’t as easy as it seems. At first I tried really hard to be perfect but I kept failing. Then I tried to go RIGHT on top of the pen line and failed. So I eventually gave up and just whipped around the inside of the circle I drew in the hopes that the next step would make most of the pen mark disappear. * Grab your fancy edged scissors and cut out those circles. Technically you can use regular ol’ scissors but, lets face it, the fancy ones are kinda cool. I really like the ones I have since it isn’t that important to make perfect lined up cuts like it is with a basic scallop edge. Use what you have. I’m sure it will be gorgeous. * I filled the goodie pockets with mini m&m s. The mini ones fit really well especially since I didn’t leave much room open at the top of each circle! Of course you can fill it with anything that fits. After dinner mints would be fun. I made one for Riggins and Captain Shadow that had doggie training treats in them. Poor Kira got scolded by a number of adults for feeding the dogs chocolate (an obvious no-no) before I could inform them they were made with dog safe treats. * Obviously you can decorate the front anyway you want. I picked out a few sheets of scrapbooking paper that seemed fall-ish and cut them into little strips. Then I sewed the strips to the treat pockets right where the opening was. Now the treat pockets aren’t only decorated but sealed! * Finally I added a ribbon and name tag that I printed off the computer. If I was to do this again I wouldn’t have glued on the ribbon but instead sewed it on at the same time I did the decorative paper. Oh well. Live and learn. * Place your fantastic creations at each place setting. When it is time to eat just rip open. The freezer paper is kinda tough to tear but some genius at our table (I really wish I could say it was me but I think it was my mom or maybe Logan) realized if you rip off the decorative paper like a tag it re-opens the top giving you access to the secret treats! There you go! 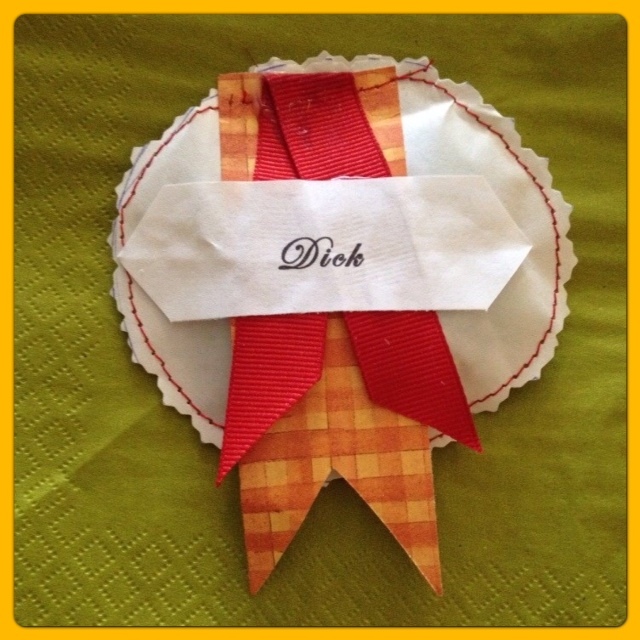 Festive, yummy, and fun place cards for your holiday table. They were a big hit! Raisins and Grapes – second biggest vet bill I ever had was because Riggins ate some yogurt covered raisins. It is also one of the few times he has had to spend the entire night at the vet. Neither one of us was very happy. My house is now grape/raisin free. Poinsettias – bad flower. I had these growing in my backyard when I moved to this house and had to have the gardener take them out. I suppose I could have done it myself … but I didn’t. Holly and mistletoe are also bad holiday plants. Your Christmas Tree is mildly toxic so to be safe go fake! Macadamia Nuts – Most nuts aren’t good so just stay clear of any of them. Sugar – Sugar isn’t great but Xylitol is deadly even in small amounts. I suggest not using the sugar substitute and when possible don’t purchase products that have it (gum, candy, mouthwash & toothpaste sometimes do … your dentist wants you to use it since it is actually good for your teeth and gums). Cooked bones – they easily splinter and can cause damage. Most raw bones are fine but just keep an eye on the dog and when the bone starts splintering take it away. Onions and chives are bad. Oddly cinnamon and garlic aren’t bad and in the right quantities can actually be good. There are a zillion other bad/good things so google and ask your vet for others.